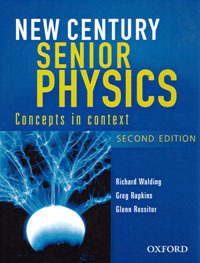 2007 Syllabus - Our unofficial Home Page for the Senior Physics syllabus. The Authors - meet them. Special Features - which make it special. Publication Details - size, cost, how to order. Extended Experimental Investigations - 300 suggestions for students. Extended Experimental Investigation Hints - for producing killer EEIs. Worked Solutions -to selected complex reasoning problems. Puzzle Solutions -to all 400 Novel Challenge puzzles in margins of the New Century 2nd edition. Summaries and Objectives - a useful study aid. Errata - mistakes in the text. Email the author at waldingr49@yahoo.com.au - with your questions. Note: these web pages have been designed as a resource for students and teachers by the authors. They are not official Oxford University Press web pages so don't contact them if anything goes wrong. Email the author. To purchase copies, contact OUP or your favourite bookseller.